One day the renowned spiritual father Daniel of Zagora, Thessaly came to the school to hear confessions. Athanasios became Daniel's disciple, remaining with him until the latter's death. Not long after this, Fr. Daniel decided to go to the Holy Mountain for quiet and spiritual struggles. Athanasios begged his Elder not to leave him, but to take him with him. He expressed the desire to travel to Mount Athos, the Garden of the All-Holy Virgin, and to become a monk. Fr. Daniel instructed Athanasios in the monastic life, which is called "the art of arts, and the science of sciences." The holy Elder was a perfect teacher who was accomplished in the spiritual life, and Athanasios was an attentive student. After a time Fr. Daniel tonsured his pupil, and told him he had to learn three important lessons. First, he must cut off his own will. Secondly, he must acquire humility. Finally, he must learn obedience. "If you cut off your will, if you become humble, and if you practice perfect obedience, you will also make progress in the other virtues, and God will glorify you." After a further period of testing, Fr. Daniel tonsured Athanasios into the Great Schema and gave him the name Arsenios. The Saint remained on Mount Athos with his Elder for six years. Then they had to leave the Holy Mountain because of the controversy against the so-called "Kollyvades," who called for a strict adherence to Holy Tradition. The name comes from the kollyva (boiled wheat) used in the memorial service. Part of the controversy involved the debate on whether it was proper to serve memorial services for the dead on Sunday. The Kollyvades believed that these services were inappropriate for the Day of Resurrection, but should be served on Saturday. The Kollyvades advocated frequent Communion, rather than the practice of receiving the Holy Mysteries only a few times during the year. When Fr. Daniel and Saint Arsenios left Athos, it was probably due to the animosity of those who opposed the Kollyvades. Early in 1821, before the Greek War of Independence, they went to the Monastery of Penteli near Athens. Their stay was a brief one, for Fr. Daniel foresaw the destruction of the monastery by the Turks. The two made their way to the Cyclades Islands in the southern Aegean Sea. First they stopped at Paros, perhaps because some of the Kollyvades had settled there. Eventually, they decided to live on the island of Pholegandros. Since there were no teachers for the children, the inhabitants entreated Fr. Daniel to allow Saint Arsenios to instruct their children. The Elder agreed, and had Arsenios ordained as a deacon. Then he was appointed to the teaching post by the government. The Saint remained there as a teacher from 1829 to 1840. He taught the required subjects in school, but he also helped his students to form a good character, and to live as pious Christians. Elder Daniel had passed away in 1837. Before his repose, he asked his disciple to take his remains to Mount Athos after two years. Arsenios left Plolegandros in obedience to Fr. Daniel's request, planning to stop at Paros then continue to the Holy Mountain. On Paros the abbot of Saint George's Monastery, Fr. Elias Georgiadis, told Arsenios that it was God's will for him to remain on Paros. This was providential, because Mount Athos was undergoing great difficulty after the Greek War of Independence. 3,000 Turkish soldiers occupied Athos, resulting in the departure of 5,000 of the 6,000 monks. In 1840 Arsenios entered the Monastery of Saint George on the island of Paros. Arsenios joined the community at Saint George's Monastery on the northern end of Paros. There he found spiritual strivers of true wisdom and excellent conduct, who were worthy models for him to follow. When he was ordained to the holy priesthood at the age of forty-seven, Arsenios intensified his spiritual efforts. Every day he studied the Holy Scriptures and the writings of the Fathers, and became adept at the unceasing prayer of the heart. He also began to show forth the gift of tears. In this, he resembled his patron Saint Arsenios the Great (May 8), who continuously wept tears of contrition. Saint Arsenios foresaw his death a month before it occurred. At the Liturgy for the Feast of Saint Basil (Jan. 1), he announced that he would soon depart from them. With great effort, he was able to serve for the Feast of the Theophany (Jan. 6). After the service, he told some nuns that this had been his last Liturgy. News of the Saint's illness and approaching death spread quickly to all the villages of Paros. People wept because they were about to lose their Spiritual Father, and they hastened to bid him farewell and to receive his blessing. On January 31, 1877 Saint Arsenios received Holy Communion for the last time and fell asleep in the Lord. For three days, people came to kiss his body, then they followed the funeral procession to the burial site which he himself had selected. 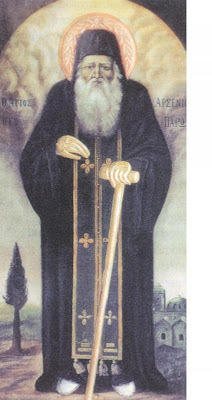 Saint Arsenios of Paros was glorified by the Patriarchate of Constantinople in 1967. He is also commemorated on August 18 (the uncovering of his relics). - Practice self-observation. And if you want to benefit yourself and your fellow men, look at your own faults and not those of others. The Lord tells us: "Judge not, that you not be judged, condemn not that you not be condemned." And the Apostle Paul says: "Who are you that you judge another man's servant?" - If you want Christ to bless you and what you have, when you meet some poor individual, who is hungry and asks you for food, give him. Also, when you know that some poor man, or a widow, or an orphan are hungry, do not wait for them to ask you for food, but give them. Give with pleasure, and be not afraid that your will become indigent. Have faith that Christ invisibly blesses your few possessions, and you shall never starve, nor will you be in want till the end of your life. 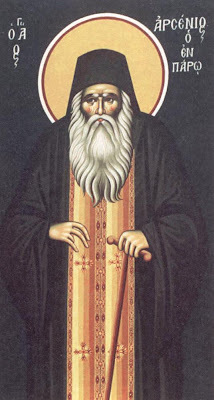 Thou didst ardently emulate the spiritual endeavor of the Venerable Ascetics through a virtuous life, in recent times, O Holy Arsenios; for having led an angelic life on the island of Paros, thou didst receive from Heaven the gift of miracles, granting to those who honor thee grace and mercy. The glory of Epiros and the boast of Paros, the protector of Dasous Monastery, we honor you O Arsenios. You were seen as an angel on earth and through asceticism received heavenly virtues, because of this you were glorified by God granting us miracles, O Father. Glory to Christ Who glorified you, Glory to Him Who showed you wondrous, Glory to Him Who granted to us an unsleeping intercessor. To thee, O God-inspired Father, we chant hymns of praise, as an imitator and peer of the Venerables, and a most divine servant of the Savior. Being full of the gifts of the Holy Spirit, bestow always thine abundant grace upon us, who cry unto thee: Rejoice, Father Arsenios. Rejoice thou O splendor of Priests, and divine exemplar of Monastics; rejoice thou ardent protector of Paros, most blessed Arsenios, who art of the choir of Venerables.